No brag here just my dilemma. I feel that we bike lovers need a different one for each day of the week. I have a rather hoped up Road King and love it. Perhaps It will grow on me but it is anemic as I was expecting more . Maybe I will keep it...perhaps trade it for a Vrod. 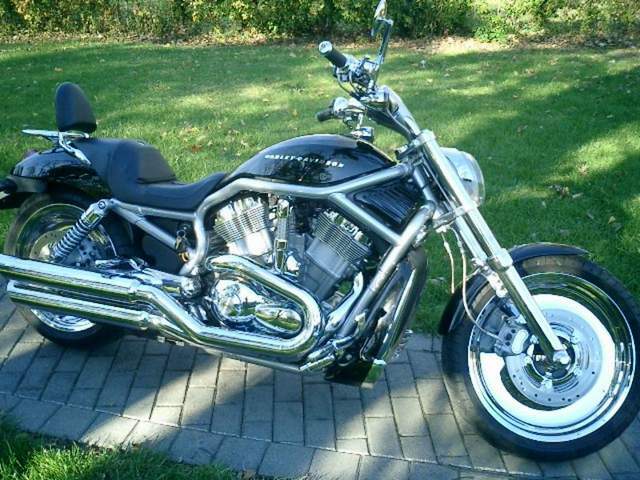 What is the consensus on the best V Rod to acquire? Knowing me it will end up looking like and being a bagger, if that helps sway the thought process. I've researched buying a V-rod a few times. The answer to "which version?" I've always found is the same as the one stated upthread - the Street Rod is the one to get. Playa76911S: Not to mention, the engine was engineered by Porsche. It's the only HD I lust after. That engine looks huge, could they have put it in a tighter/sportier frame? Seems like they should have made some kind of effort to recoup all the $$$ the put into developing that engine. Looking at local CL yesterday and spotted this one , nice looking machine . If I had the spare cash I would consider it . I had Iron Head, a double plug, ported polished, 1o.5-1 , swiss cheese wheels (T&O) rode from coast to coast and most states in between. Great bike but was a flexible flyer in the turns. Ha. Not a Harley exclusive in the corners. Early BMW's known as rubber cows. Believe it or not - My Road king with all new rear swing arm bushings and an aftermarket swingarm stabilizer is the most stable platform for a big bike i have ever been on. I do not feel the tar snakes, or get a whip from road grooves. My F6B is much more sensitive to all the above. The road king is here to stay. Not to mention, the engine was engineered by Porsche. It's the only HD I lust after.